Introduction: The superficial anterior atlanto-occipital ligament (SAAOL) is a narrowband located anterior to the anterior atlanto-occipital membrane. Nearly forgotten, it has not been well described in older anatomical textbooks and is missing in the current anatomical literature. As all of the binding structures of the craniocervical junction (CCJ) are important in maintaining stability, this study aims to clarify the anatomy and potential function of the SAAOL. Materials and Methods: The CCJ from ten fresh-frozen cadavers was studied. These specimens were derived from three males and seven females, and the age at death ranged from 57 to 91 years (mean, 79.8 years). The length, width, and thickness of the SAAOL were measured. In five specimens, the force to failure was recorded. Results: The SAAOL was found between the anterior tubercle of the atlas and the occiput and located as central thick fibers in front of the anterior atlanto-occipital membrane in 9 (90%) specimens. In one specimen, the vertical band to the occipital bone did not attach to the anterior tubercle of the atlas, but extended to the anterior aspect of the axis. The mean length, width, and thickness of the SAAOL were 19.8, 6.2, and 0.6 mm, respectively. The force to failure for the ligament was 38.8 N.
Conclusion: The SAAOL was a constant structure of the anterior atlanto-occipital joint. This ligament seems to be a secondary stabilizer of the CCJ by limiting the extension of CCJ. Knowledge of this ligament may help in further understanding of craniocervical stability. The craniocervical junction (CCJ) includes occiput, Atlas More Details, axis, and specialized ligaments and membranes. The CCJ is the most flexible joint of the spine., Knowledge of its anatomy and biomechanics is vital to succeed in the diagnosis and treatment of the various pathological conditions in the CCJ. The ligaments of the CCJ, especially the transverse and alar ligaments, have been well studied.,,,, By contrast, there is a rarely discussed and nearly forgotten ligament on the CCJ, the superficial anterior atlanto-occipital ligament (SAAOL). The ligament is described in antiquated anatomical texts as running vertically anterior to the anterior atlanto-occipital membrane (AAOM) (synonym for the anterior atlanto-occipital ligament).,, The SAAOL is poorly understood, and to date, no study has focused on its anatomy and potential function. Therefore, the present study aims to clarify the anatomy and biomechanical function of the SAAOL using fresh-frozen cadavers. The CCJs from nine fresh-frozen Caucasian cadavers and one Asian cadaver were used for this study. These specimens were derived from three males and seven females, and the age of the cadavers at death ranged from 57 to 91 years (mean, 79.8 years). With the cadavers in the supine position and the necks extended, the mandibles and prevertebral tissues were removed. The prevertebral muscles including the longus capitis, longus cervicis, and rectus capitis anterior were removed, and the ligaments between the basilar part of the occipital bone and atlas were observed. When the SAAOL was identified, its length, width, and thickness were measured. All measurements were performed using a microcaliper (Mitutoyo, Kanagawa, Japan) with a resolution of 0.01 mm and an accuracy value of ±0.025 mm. After the measurements, the occiput and C1 and C2 vertebrae were transected en bloc in five specimens, and ligaments and membranes, except the SAAOL and its bony attachment, were removed. Sequentially, the anterior arch of the atlas was grabbed with the bony clamps in the midline to pull the ligament vertically [Figure 1]. In five specimens, the tensile force (N) was recorded using a tensile testing machine (M2-200, Mark-10 Corporation, Copiague, New York, USA). No obvious pathological changes or signs of previous surgery in the areas were found in any specimen. The study was conducted in accordance with the requirements of the Declaration of Helsinki (64th WMA General Assembly, Fortaleza, Brazil, October 2013). In all specimens, the SAAOL was observed traveling between the basilar part of the occipital bone and the anterior tubercle of the atlas. In all specimens, the ligament ran anterior to the AAOM. The SAAOL was identified in 9 (90%) specimens, uniting the basilar part of the occipital bone and the anterior tubercle of the atlas [Figure 2]. However, in 1 (10%) specimen, the vertical band ascending to the basilar part of the occipital bone did not attach to the anterior tubercle of the atlas, but continued to the anterior aspect of the axis. This single ligament variant of the SAAOL we termed the superficial anterior occipito-axial ligament (SAOAL). The SAAOL and SAOAL were slightly wider at the attachment onto the basilar part of the occipital bone and narrower at the attachment onto the atlas (n = 9) or axis (n = 1). The mean length of the SAAOL was 19.8 ± 4.0 mm (range, 15.1–24.7 mm). The mean width and thickness of the SAAOL were 6.2 ± 1.6 mm (range, 3.8–9.5 mm) and 0.6 ± 0.1 mm (range, 0.5–0.8 mm), respectively. The peak force (N) at failure for the ligament was 38.8 ± 9.7 N (range, 30–57 N). With manual hyperextension of the CCJ, the SAAOL became taut, and with hyperflexion, the ligament became lax [Figure 3]. With the intentional removal of the SAAOL and SAOAL, the degree of flexion and rotation of the CCJ did not change significantly. The CCJ has two joints, the atlanto-occipital and atlantoaxial joints, and includes important structures, for example, spinal cord, cranial nerves, and blood vessels., Different biomechanics of both joints enable the neck to rotate, flex, and extend.,, Both joints are composed of a complicated array of ligaments and membranes, which protect the neurovascular structures of this region. To date, these ligaments including some accessory ligaments have been studied.,,,,, However, the SAAOL has not been studied. Quain defined the SAAOL as a thick “accessory ligament” whose fibers reinforcing the AAOM. Testut described it as having a width of 5–6 mm. These previous descriptions regarding the SAAOL are consistent with our findings. In the present study, the SAAOL was made up of dense fibers in the midline and was anterior to the AAOM in all cases. In 90% of the specimens, the SAAOL connected the basilar part of the occipital bone and the anterior tubercle of the atlas; however, in 1 (10%) case, the ligament did not attach to the anterior tubercle of the atlas and appeared to be a direct continuation of the AAAL. We named this the SAOAL, which appears to be an anatomical variation of the SAAOL. The SAAOL is a constant structure of the CCJ. Further experiments are required to elucidate further how the SAAOL is involved in pathological as well as normal conditions of the CCJ. The authors thank those who donated their bodies for anatomical study and research. Oakes PC, Sardi JP, Iwanaga J, Topale N, Oskouian RJ, Tubbs RS, et al. Translation of Hecker's 1922 “the occipital-atlanto-axial ligament system” A study in comparative anatomy. Clin Anat 2017;30:322-9. White AA 3rd, Panjabi MM. The clinical biomechanics of the occipitoatlantoaxial complex. Orthop Clin North Am 1978;9:867-78. Debernardi A, D'Aliberti G, Talamonti G, Villa F, Piparo M, Collice M, et al. The craniovertebral junction area and the role of the ligaments and membranes. Neurosurgery 2011;68:291-301. Lopez AJ, Scheer JK, Leibl KE, Smith ZA, Dlouhy BJ, Dahdaleh NS, et al. Anatomy and biomechanics of the craniovertebral junction. Neurosurg Focus 2015;38:E2. Dvorak J, Panjabi MM. Functional anatomy of the alar ligaments. Spine (Phila Pa 1976) 1987;12:183-9. Panjabi MM, Crisco JJ 3rd, Lydon C, Dvorak J. The mechanical properties of human alar and transverse ligaments at slow and fast extension rates. Clin Biomech (Bristol, Avon) 1998;13:112-20. Iwanaga J, Sardi J, Voin V, Chapman JR, Oskouian RJ, Tubbs RS, et al. Anatomy of alar ligament part I: Morphometrics and variants. World Neurosurg 2017;107:1001-6. Sardi JP, Iwanaga J, Schmidt C, Rustagi T, Chapman JR, Oskouian RJ, et al. 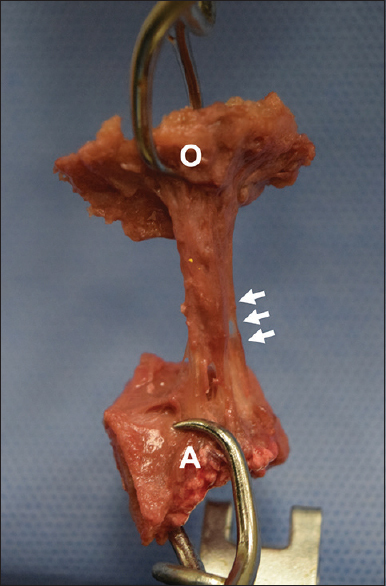 Anatomy of the alar ligament: Part II: Variations of its attachment onto the dens. World Neurosurg 2017;107:1007-11. Iwanaga J, Sardi JP, Laws T, Chapman JR, Oskouian RJ, Tubbs RS, et al. Anatomy of alar ligament part III: Biomechanical study. World Neurosurg 2017;107:1012-5. Morris H. The Anatomy of the Joints of Man. Philadelphia: Blakiston; 1879. Sharpey-Schäfer E, Symington J, Bryce T, editors. Quain's Elements of Anatomy. 10th ed., Vol. 2. Part. 2. New York: Longmans, Green and Co.; 1892. Morris H. Morris's Human Anatomy: A Complete Systematic Treatise. 6th ed. Philadelphia: Blakiston; 1921. Menezes AH, Traynelis VC. Anatomy and biomechanics of normal craniovertebral junction (a) and biomechanics of stabilization (b). Childs Nerv Syst 2008;24:1091-100. Tubbs RS, Hallock JD, Radcliff V, Naftel RP, Mortazavi M, Shoja MM, et al. Ligaments of the craniocervical junction. J Neurosurg Spine 2011;14:697-709. Selecki BR. The effects of rotation of the atlas on the axis: Experimental work. Med J Aust 1969;1:1012-5. Panjabi M, Dvorak J, Duranceau J, Yamamoto I, Gerber M, Rauschning W, et al. Three-dimensional movements of the upper cervical spine. Spine (Phila Pa 1976) 1988;13:726-30. Wolfla CE. Anatomical, biomechanical, and practical considerations in posterior occipitocervical instrumentation. Spine J 2006;6:225S-232S. Testut L. Human Anatomy Treaty: Osteology-Arthrology-Myology. 6th ed., Vol. 1. Barcelona: Salvat; 1902. Dvorak J, Schneider E, Saldinger P, Rahn B. Biomechanics of the craniocervical region: The alar and transverse ligaments. J Orthop Res 1988;6:452-61. Au J, Perriman DM, Pickering MR, Buirski G, Smith PN, Webb AL, et al. Magnetic resonance imaging atlas of the cervical spine musculature. Clin Anat 2016;29:643-59. Shen XH, Xue HD, Chen Y, Wang M, Mirjalili SA, Zhang ZH, et al. Areassessment of cervical surface anatomy via CT scan in an adult population. Clin Anat 2017;30:330-5. Badshah M, Soames R, Ibrahim M, Khan MJ, Khan A. Surface anatomy of major anatomical landmarks of the neck in an adult population: A Ct evaluation of vertebral level. Clin Anat 2017;30:781-7. Sanchis-Gimeno JA, Perez-Bermejo M, Rios L, Llido S, Bastir M, Blanco-Perez E, et al. Analysis of the relationship between the double transverse foramen and the possibility of developing clinical symptoms after Whiplash. Clin Anat 2017;30:761-6. Sharif K, Sharif A, Jumah F, Oskouian R, Tubbs RS. Rheumatoid arthritis in review: Clinical, anatomical, cellular and molecular points of view. Clin Anat 2018;31:216-23. Yoon SY, Moon HI, Lee SC, Eun NL, Kim YW. Association between cervical lordotic curvature and cervical muscle cross-sectional area in patients with loss of cervical lordosis. Clin Anat 2018;31:710-5.